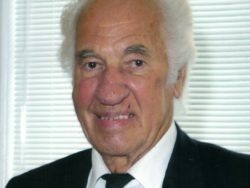 Doug Keena - Heritage Funeral Homes Inc.
of Waterloo, passed away on December 31, 2018 after almost 89 years. Beloved husband of Frances “Fran” (nee Burnett) Keena for 65 years. Loving father of Kim and Kirby (Gina). Cherished grandfather of Remmington “Remy”. Fondly remembered by many family members and friends. Predeceased by sister Evelyn and brother-in-law Erle Thornton of Stratford area. Loved uncle of Pauline (Dana) of Stratford and Diane (Francis) of Ottawa. Brother-in-law of Joy Burnett of Clifford, Earle and Karen Burnett of Bancroft, Ronald Schieck of Cambridge, Stewart and Trudy Burnett of Brockville and Phyllis Fletcher of Drayton. Predeceased by sisters-in-law Ethelwyn Burnett, Marjorie Schieck, and June Burnett, and brothers-in-law, Bill Burnett and Ray Fletcher. Doug grew up in Sebringville Ontario and served as an ironworker for more than 40 years. He traversed Ontario and Canada building bridges (Burlington Bridge) and towers (CKX-TV Craig Television Tower in Hayfield Manitoba which is currently the tallest guyed-mast antenna structure in Canada). Doug was hard working and meticulous. He always had a project on the go. Throughout his life, Doug was curious about so many different things. He had many interests including the farm, motorcycles, collectibles, current events and sports. He had an uncanny ability to recall names, places and events. Doug related easily to people. He enjoyed telling stories and listening to others about their lives and adventures. Cremation has taken place and a private funeral service will be held at the Heritage Funeral Home, Drayton. As expressions of sympathy, donations may be made to Innisfree House (Kitchener) https://lisaardandinnisfree.com/ways-to-give/donate/ or a charity of your choice. The funeral home (519-638-3072) is available to assist with donations.